New England Patriots owner Robert Kraft watches as players warm up during a practice Thursday, Feb. 1, 2018, in Minneapolis. BOSTON — Patriots owner Robert Kraft reportedly rejected an offer that would have allowed him to avoid prostitution charges in exchange for admitting that a court likely would have found him guilty, according to WBZ-TV. The Palm Beach State Attorney says it offered Kraft, and 24 other men, the standard diversion program, which is offered to first time offenders. The men would have to admit they would be found guilty, perform 100 hours of community service, attend a class on the dangers of prostitution and pay $5,000 per count. An investigative reporter for ESPN stated that Kraft’s legal team filed a motion to suppress video evidence in the case. 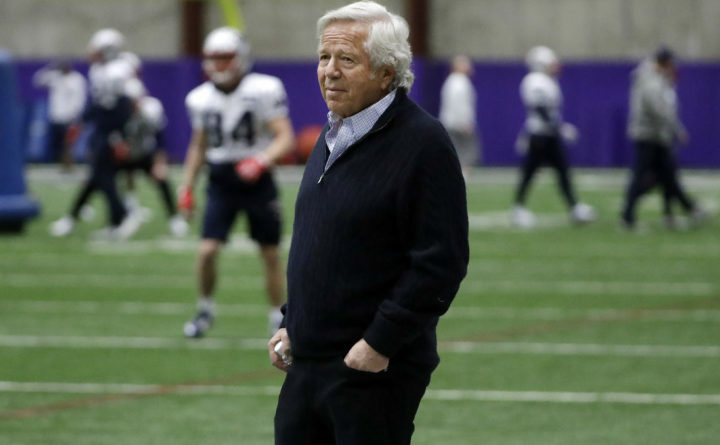 On Wednesday, the Boston Globe reported Kraft rejected the plea deal. Kraft’s legal team is still negotiating with prosecutors, the Globe reported. Kraft previously released a statement denying he broke any laws. Kraft’s case is due in a Florida courtroom on March 28, according to WBZ-TV.